How to get to the Ker Eden Campsite. 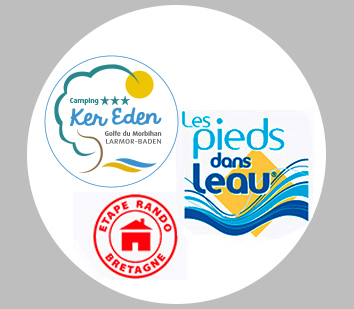 Ker Eden is ideally located in the heart of the Gulf of Morbihan, easy access for cars, caravans, camping-cars, hikers, backpackers and cyclists. If you’re passing Vannes : when on the RN165, in Vannes, take the exit towards Arradon/Ile aux Moines. Follow the D101 and then the D316 until you reach Larmor Baden, then turn right on Route d’Auray. You will see the sign for the Campsite as you get closer. If you’re passing Lorient : On the RN165, in Auray, take the exit towards Pluneret, then towards Le Bono. Follow the road passed Le Bono then continue on the D101 until Baden. At the round-about take the exit towards Larmor-Baden, the D316, then you will arrive on the Route d’Auray. Bus stops : the bus line Kicéo that runs from Vannes/Auray to Larmor Baden center (only 800m from the campsite). Find out more on their website. If you haen’t brought you own bike, you can rent one on the spot when you arrive. 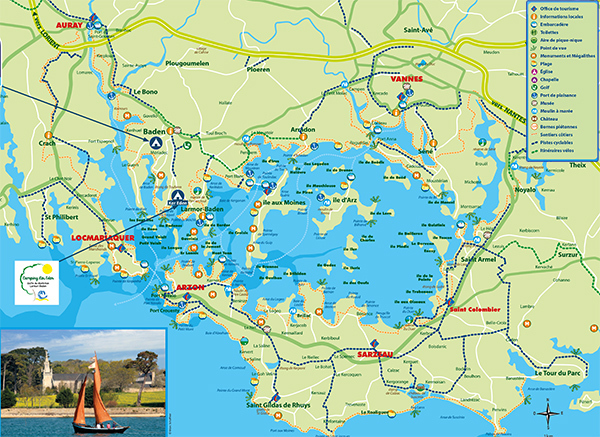 If you’re travelling by foot, the campsite has a direct access to the coastal walk GR34 of the Gulf of Morbihan.